After a huge success last year with their sold out warehouse take-over, Free Your Mind welcomed back Sasha & Digweed last Saturday, February 9th! Sasha & John Digweed have had an excellent year in 2018 so it was time to come back to Amsterdam and celebrate with an expectation it will be even more spectacular then last year..
Sasha & John Digweed may have had a long hiatus without playing back to back, but they have lost none of their magic. The crowds, too, are just as desperate to see these dance legends in action as they ever were, despite the fact they have now been doing so for more than 25 years. 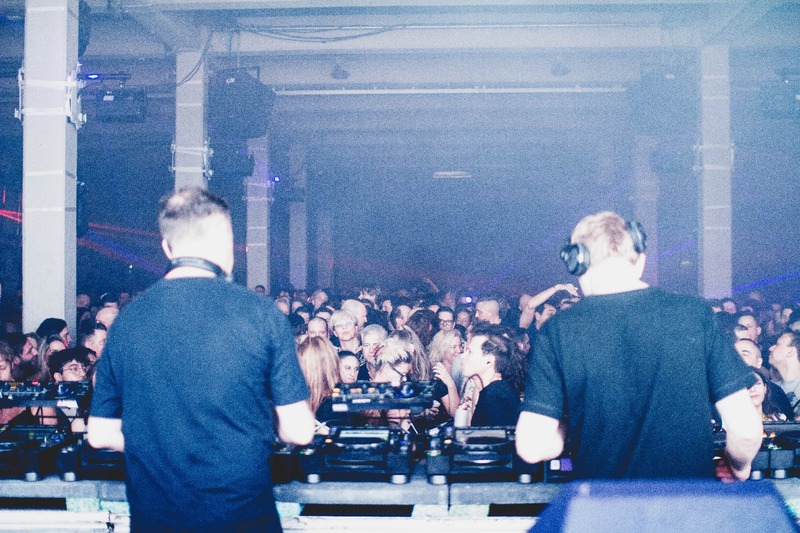 Their latest coming together was at Warehouse Elementenstraat in Amsterdam, where they also played to a sell-out crowd last year. The venue is a perfect one for this sort of party: a raw warehouse with steel columns, exposed architecture and a stripped back industrial feel that means the music will always be the focus. The crowd is made up of party people of all ages. Some have clearly been watching this pair for decades, others are here to discover what all the fuss is about. The sound on the night is crisp and punchy, with each kick drum sounding as intended, and synths really making their impact felt. Behind the DJ booth, there are various visuals projected all night to add an extra dimension to the show – we were in awe as the night went on. When the duo of Sasha & Digweed stepped up to the decks, the crowd surged forward in sheer elation. You could really appreciate that the guys are true masters at work who know when to bring in certain sounds and intricacies. With unspoken chemistry they set to work, layering down drums and synths that are all encompassing and melodic throughout. Sasha, of course, is about to unveil his 100th release on his Last Night On Earth label and teased in tracks from the upcoming release throughout the night, while Madben’s ‘Acid Madness’ also got a big reaction. It was an intense trip from start to finish, with tight mixing and timeless selections. The crowd were not going home early without letting the British DJ’s know just how appreciated they are in Amsterdam – This was an epic night that proved these two are as on-point and in demand as they’ve ever been.